What is the Community Yard Tree Giveaway Grant? The Community Yard Tree Giveaway program empowers Philadelphia community groups to host free yard tree giveaways in their neighborhoods. Through this program, groups can partner with TreePhilly to help green their neighborhood by distributing trees to neighbors, friends, and families. TreePhilly provides FREE trees, event support, mulch, education, and a $200-500 grant award. Partners are responsible for hosting and promoting the event and connecting with their community. 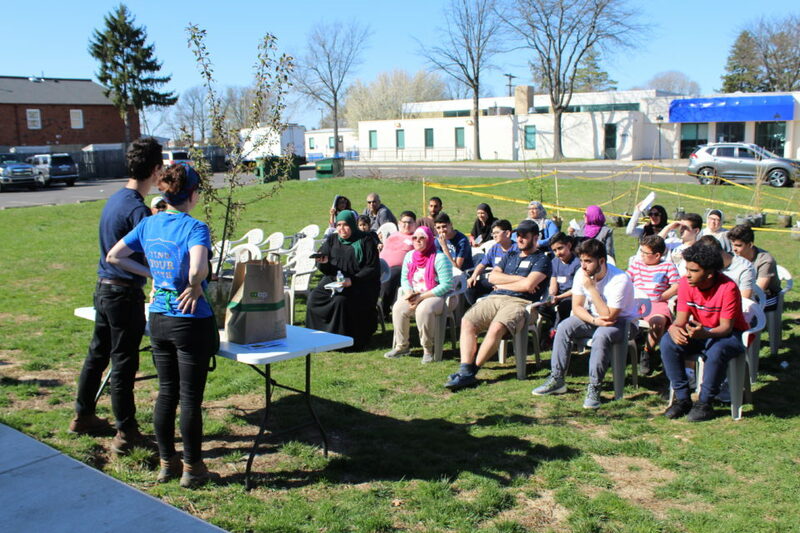 This season we are offering up to 12 grants to community groups to host yard tree giveaways in their neighborhoods between March 25th and May 8th 2019. For information on previous events, check out Community Yard Tree Giveaways. For photos, check out our Flickr page. Read more about the Community Yard Tree Giveaway Grant below. The deadline to submit applications for Spring 2019 Community Yard Tree Giveaway Grants is Wednesday, February 6th, 2019. Winners will be announced on Wednesday, February 13th, 2019. •	Trees given away must be planted in Philadelphia. •	Trees given away must be planted in the ground on private property. •	Trees CANNOT be planted in the sidewalk or in containers. •	Tree recipients must commit to watering, mulching, and caring for their trees. •	Applicants must serve a Philadelphia community— Nonprofits, faith-based organizations, civic associations, CDCs, Tree Tenders groups, local businesses, school associations, and similar organizations. One 501(c)(3) group to act as fiscal sponsor and receive the monetary award. One group to act as the lead organization for executing giveaway responsibilities. •	Groups must have the staff or volunteer capacity to plan, promote, and run an event. •	Giveaway events must be held in Philadelphia. •	Giveaways must be held between March 25th and May 8th 2019. Events may not be scheduled for Thursday, May 2. •	Giveaway events must include space for planting demonstrations facilitated by TreePhilly staff. Space could be: a yard, parking lot, large sidewalk, patio, or playground. •	Giveaway events must include nearby bathroom access for volunteers and staff. Examples: if it rains, we will move the event to our indoor space or put up a tent. •	Tree giveaways may be a maximum of 4 hours. We recommend two hours for a 25 tree event and three hours for a 50, 75, or 100 tree event. Partners may propose an alternate timing if the event corresponds with another event like spring festival or local job fair. •	Planning the giveaway event: securing a space, organizing volunteers, and handling day-of logistics. •	Organizing at least 3 volunteers/staff to run event. •	All other giveaway materials and supplies, including tables, chairs, pens, registration sheets, etc. *** All deliverables must complete and received before receiving the monetary award. ***Grants are not evaluated on the quantity of trees your group can give away. A 25 tree application has the same standing as a 100 tree application. *Please note that you may not receive the number of trees you request. All first-time grantees will be awarded 25 or 50 trees, returning grantees are eligible for 75 or 100 trees. Final number of trees awarded will be determined by TreePhilly based on availability and the group’s capacity. TreePhilly will select tree species for each grantee. Species are generally native to the area, well suited for urban environments, and may include shade trees, smaller ornamental trees, and/or fruit trees. *Only not-for-profit organizations are eligible to receive the monetary award. Other organizations are invited to apply with a not-for-profit fiscal sponsor.